On February 12th, President Trump released his FY 2019 budget request. His request unfortunately repeats many of the same, misguided ideas of his last budget proposal--ideas that were met with a resounding rejection from Congress last year. His request includes the termination of our nation's cultural grant-making agencies, including the National Endowment for the Arts (NEA), the National Endowment for the Humanities (NEH), the Institute of Museum and Library Services (IMLS), and the Corporation for Public Broadcasting. To recap, Congress is still working to finish FY 2018 funding, even while FY 2019 is underway. On November 20, 2017, the U.S. Senate Appropriations Committee fully restored the funding level for the National Endowment for the Arts (NEA) and National Endowment for the Humanities (NEH) at $150 million each for FY 2018. In July, the U.S. House of Representatives passed its version of the appropriations bill that included $145 million for the NEA and NEH. Final FY 2018 funding is anticipated by March 23rd, the date current funding is set to expire, as part of the short-term funding patches Congress is passing while working to write final funding bills. Now is a critical moment in the process. Ask your congressional delegation for support of the NEA at least $150 million for FY 2018, and $155 million for FY 2019. Now more than ever is the time to tell our story and make our case again and again at the federal, state, and local levels that the arts matter. Take two minutes now to#SAVEtheNEA by joining Americans for the Arts and Arts Action Fund members in sending a unified message to Congress to restore full funding to the NEA and NEH. 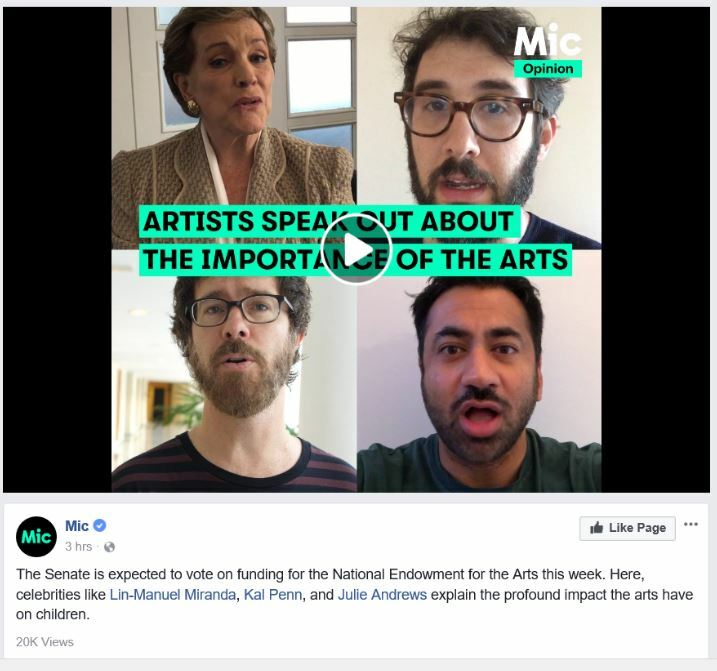 Check out the video from our Artists Committee members Lin-Manuel Miranda, Kal Penn, Ben Folds, Josh Groban, and Julie Andrews, which has been viewed over 1 million times, and then take two minutes to send your message below. Thank you! Arts for LA is hosting its first ever Youth Arts Leadership Workshop on Saturday, October 14th (10am - 4pm) at The Broad Stage Administrative Offices. This program is designed for young leaders interested in advocating for the arts in their schools and communities. The Youth Arts Leadership Workshop offers young leaders between the ages of 12-18 years old the opportunity to enhance their advocacy skills through youth-led workshops focusing on Personal Leadership, Advocacy 101 & Best Practices, Marketing Strategies and Student Engagement. If you know of any youth leaders who may be interested in this workshop, please make sure to RSVP today due to limited availability of space. Travel stipends (for youth participants who are interested in attending the workshop) are available upon request by calling (213) 225-7526 or emailing info@artsforla.org. With the LA County elections a mere month away, Arts for LA is currently conducting our Arts & Culture Candidate Surveys, which promote dialogue around issues related to arts education and cultural policy with candidates and residents. If you live in any of the school districts or cities below, we need your help contacting candidates to encourage them to submit their survey responses. We provide a script and a list of candidates and their contact information. Phone calls can be made from home or the Arts for LA offices, depending upon availability. If you're available, please contact Program Manager Abril Iniguez-Rivas at ainiguez@artsforla.org or call (213) 225-7580 as soon as possible. Volunteer callers are needed from Monday, October 10 - Friday, October 20.